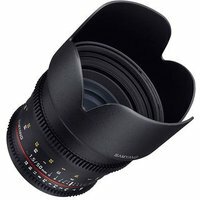 The Samyang 50 mm T1.5 AS UMC video lens gives 46.2 degrees field of view, and thanks to high brightness value of T1.5 (f/1.4) it comes as a great tool in poor lighting conditions. This manual focus lens ensures exceptionally smooth and aesthetic mapping for out of focus areas beyond the focal plain, producing a smooth, natural bokeh effect. This feature will be appreciated by professional filmmakers and photographers taking portrait photos. Optically, the lens consists of nine lens elements arranged in six groups (including one aspherical and one hybrid aspherical lens element) to ensure high contrast and natural colour reproduction, all lens elements have been covered with multi-layered UMC anti-reflective coatings. Compatible with full-frame and APS-C sensors.